Online measurement of COD, BOD, TOC, TSS, Nitrate and Nitrite. Patent pending optics for highest accuracy, stability and reliability. The best results and compensation is achieved by using the full UV-VIS range from 200 - 720 nm. 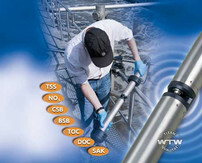 Advanced ultrasonic cleaning system guarantees minimal maintenance. The Titanium and PEEK materials are used for extreme durability.